IDENTIFY THE DOCTRINE (reciting a scripture): Write, “Be ye kind one to another” (Ephesians 4:32) on the board with a number from 1 to 6 written beneath each word. Assign each child a number 1 to 6. Begin by havnig all of the 1’s stand and say “Be” and then quickly sit down. Then have the 2’s stand and say “ye” and quickly sit down. Continue with the rest of the phrase. Repeat several times. Then have all of the children repeat the whole phrase together. ENCOURAGE APPLICATION(sharing ways to be kind): Identify several people in the children’s lives (such as father, mother, sister, brother, grandpa, friend or teacher) with a word strip, a picture, or a simple prop (such as a tie for father or a cane for grandpa). Give the objects to a few children, and invite them to come to the front of the room. Have each child share something nice they could say or do for the person their object represents. Then have them pass their word strips, pictures, or props to other children. Repeat as time allows. Some ideas for Identifying the Doctrine: If you are going over Ephesians 4:32 here are some other ways you could use to teach the scripture. By Color: Have a few words of the scripture typed up onto different colors of paper. Then ask the children wearing that color to stand up and say the words on their paper. By Number: Place numbers underneath each chair. Have the children look under their chairs to see which group they belong to. Have them hold up their number when it is their groups turn. By Class: Have a sign for each class. Have each class stand up and say their part of the scripture. 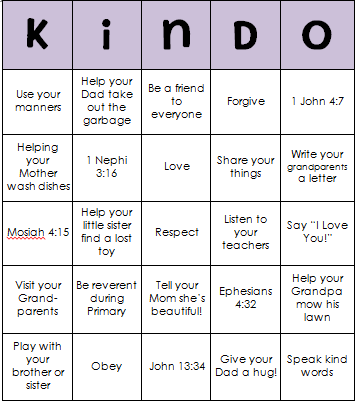 I loved the idea of playing KINDO, because what kid doesn’t love BINGO. There are a few different ways I thought you could play this. 1st Way to Play: Have a card for each child and use M&M’s, beans, buttons, etc. for markers. Have the words in a container and as you pick one have all the children mark their cards and then discuss how it is showing kindness. 2nd Way to Play: Split the Primary into 2 teams. Have a large ‘KINDO’ card for each team. You can have them displayed at the front of the room and use stickers as markers. Then just do the same as above. Names of different people and have the children say how they can show kindness. If you did the 2 team idea. You could let each child come to the front and pick a word-strip from the bucket. Then they can add the sticker to the appropriate space. But by having the children come to the front you could even have questions in each space. Or if you decide to have different people (Mother, Father, Sister,etc.) in each square, then the person who picked that can tell you how they could show kindness to that person. When one of these pieces of paper were chosen that team had lost, and the other team got to choose a square to take one of their markers off. Then you could discuss the importance of being kind and how it makes others feel when we’re unkind. I decided to make up a couple KINDO cards for you to use. I also included a blank one too. I don’t have any squares on mine with just the names of the person, but mine include words, scriptures, and ways to be kind. If nothing else you can use some of my squares to use in your own KINDO game cards. Click Here to print my KINDO game cards. Thanks again Natalie for sharing your great idea! When I first read the idea in the outline I thought about ‘Garbage Can Talk’. Sometimes when my kids say mean words or other words my husband’s parents call that ‘Garbage Can Talk’. They did a FHE on Garbage Can Talk and I’ve always loved the idea, but never did anything on it. When I saw the idea I thought that you could probably use that idea. I thought you could type/write up some words or scenarios and have them in a container. Then have a garbage can with something like ‘Unkind Words’ or ‘Garbage Can Talk’. Have a child come to the front and pick a paper. Have them read it and decide if it is Kind or “Garbage”. You could even have a picture of children or a family. If the paper is kind have them place a heart onto the picture, and if it’s unkind have them ‘toss it’. Then have the children discuss how you could change that unkind act into a way of being kind. I think for the ‘Garbage Can Talk’ I would stick with unkind scenarios. I wouldn’t put unkind words. Or you could just write unkind actions like yelling, hitting, etc. Well, that is it for me today. I hope these ideas can help you out this week. Sorry I’m posting this late again. Hopefully next week things will be a little more calm around here. Such great ideas, thanks for posting! You have SAVED me again!! Thanks so much – going to do the KINDO – so cute! !